The study of Italian at GW is enriched by many local resources. The Cultural Institute of the Italian Embassy offers a year-round program of diverse cultural activities: film series, seminars on art and literature, art and photography exhibits, talks by contemporary Italian writers, artists and film directors, and regular roundtables that discuss the political and social issues of modern-day Italy. 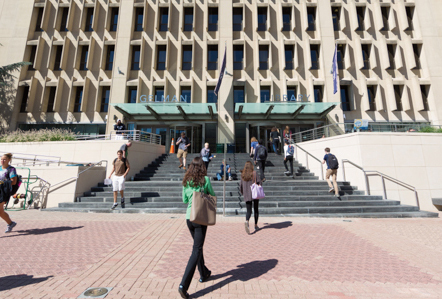 The Institute also provides a substantial number of internships to GW students. Washington is also the home to several Italian cultural associations including the Italian Cultural Society, the National Italian American Foundation and the Order of the Sons of Italy. These groups also provide internships for students of Italian as well as scholarships for study in Italy. The language, literature and culture of Italy have played a key role on the world stage since the Middle Ages, when knowledge of Italian language and culture was, as it continues to be, an important asset for cultural, political and commercial exchange. The Italian section aims to prepare students for a variety of career paths through its Italian minor, which allows students to polish their Italian and to hone their critical thinking and writing skills as they gain knowledge of Italian social and cultural life from the Middle Ages to the present. Whether discussing Dante's idea of the cosmos in the Divine Comedy, Machiavelli's understanding of leadership in the Prince, the depiction of fascism in contemporary films, or the current relationship between Italian and American foreign policy, students are exposed to central issues which founded or animate the modern world. Because of the small class sizes, students have the opportunity to work closely with faculty members and to be involved in cultural and research initiatives. Students often spend a summer or a semester on an academic program in Italy to solidify language skills and to gain a richer understanding of Italian culture. Find literary studies scholarship for all periods and genres. Gelman Library's Italian Literature research guide can help!